Project version is a TYPO3 extension that adds an entry to the TYPO3 system information in the toolbar. This entry is based either on the common ‘VERSION’ file or on the local GIT revision. No composer available? No problem! You also can find this extension at TYPO3’s Extension Repository (TER). You can straight download it from inside your TYPO3 as long, as your TYPO3 is not in composer mode. You can use your own filename and path. Note that this path still has to be accessible from your web docroot. The configuration can be done in the ExtensionConfiguration. It is also possible to change the directory of the ‘VERSION’-file. Only provide a directory path (with trailing slash ‘/’) and it will automatically search for an file called ‘VERSION’. We assume that the web document root (PATH_site) is /var/www/html. Since release 0.3.0 git is supported. This must be manually activated. In order to use git, make sure it’s available! Common case is that the local development environment is based on docker images. Many docker images do not have git out of the box available. To activate it, simply move via your preferred web browser into the TYPO3 backend. 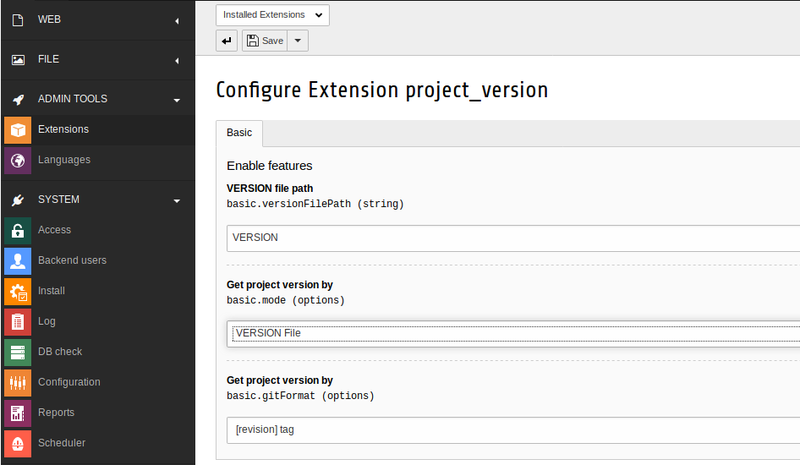 For TYPO3 v8.7 – go to “Extensions > Project Version” and configure the extension. This has changed a bit in TYPO3 v9. 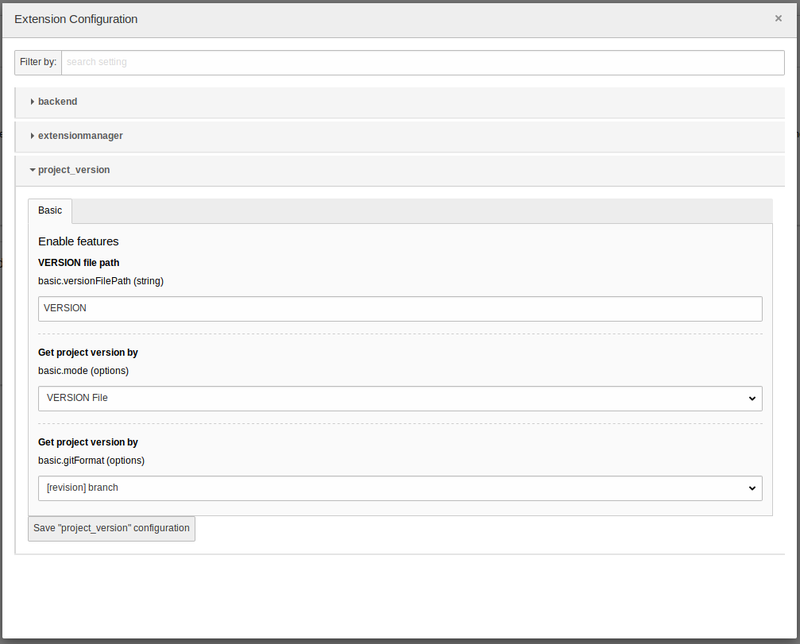 To configure the extension go to “Settings > Configure extensions” and filter for “project version”. The TYPO3 v8 version of this extension will not be maintained after release 1.0.0! But this should be no problem because TYPO3 v8 only gets bugfixes. This means, version 1.0.0 should stay compatible with all further TYPO3 v8 releases! Twitter extension brings all your recent tweets to your TYPO3 site. 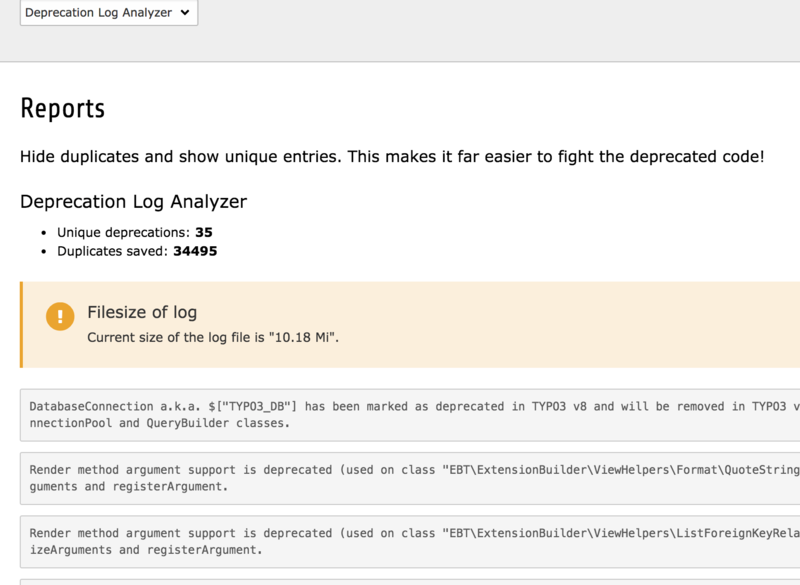 Analyze the deprecation log and show only the unique entries.